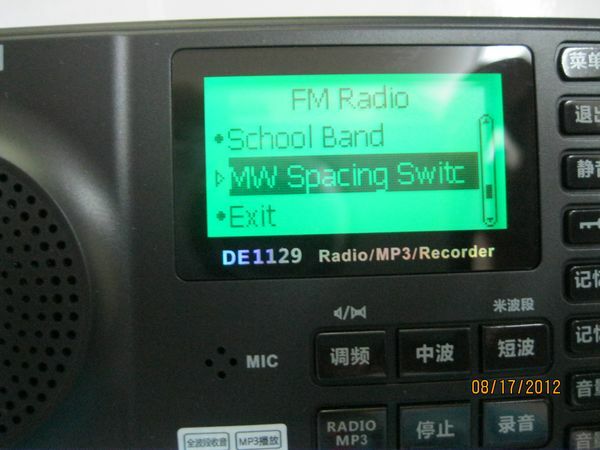 I just received confirmation from a representative at TecsunRadio.com that the Degen DE1129 will offer selectable 10kHz steps for the medium wave (AM) band in North/South America (ITU Region 2). My contact had to verify this fact by actually trying out a radio and making the selection manually (see photo), as the written radio specifications were unclear. Upon learning that its predecessor, the Degen DE1128, did not have 10 kHz stepping, it lost an audience in the Americas. I feared that the DE1129 would have the same limitations, but fortunately (for Degen) it is not. Of course, here in North and South America, we have the Grundig G2 Reporter–which is sold and supported here in the US as a DE1128 alternative. But this newest member of the Degen line is a welcome addition. This entry was posted in New Products, News and tagged DE1128, DE1129, Degen, Degen DE1128, Degen DE1129, TecsunRadio.com on August 18, 2012 by Thomas.